Do you Need Custom Carrying Cases for your Tools? People like to think that tools (screwdrivers, hammers, and the like) are reliable and can take a beating. Most are made from durable metals, but that does not mean that they are indestructible. Keeping tools in custom blow molded cases helps to keep them safe and organized. Without a custom tool case, where will you keep your tools? Many opt to throw them into metal or plastic tool boxes that do not have designated sections for each instrument. In this instance, damage will happen as tools bang against each other. Typically, scratching is the easiest thing to see. When investing in tools, people usually spend a bit more money to get tools that look aesthetically pleasing. Taking care of your tools will ensure that your tools like new. The other important reason protect gear is because it can break or deform. The head of a hammer can chip, which will make it harder to hit a flat nail. Thinner screwdrivers can bend, which will make it tough for them to use. Power tools can have wires or electronics broken, which can render them unusable. Lastly, a carrying case for tools allows you to bring them places more easily. For many, easy access to transporting tools is beneficial, even when working on your own home. Our cases are lightweight and have comfortable handles. We can help you create cases for toolsets. 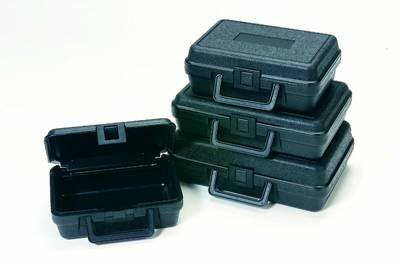 Based on the gear you own and the gear you want, we will blow mold custom carrying cases for your tools.